“Nooooo… I want to watch MY movie!” yelled my little one as I switched on the TV to watch one of my most favourite old time movies, and he stood in front of me with his arms spread out as wide as possible to cover the TV. “I won’t let you watch,” he pouted. 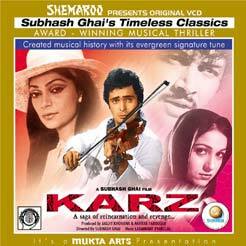 Karz- the blockbuster film directed by Subhash Ghai was released in 1980, so I assume I was only five years old when I first saw this movie! For more details on the movie, please visit http://en.wikipedia.org/wiki/Karz_(film). It is also available on youtube. The film started with the courtroom drama which clearly held no interest for my son, but when the scene comes up when Sirjuda (Prem nath) – the finger-tapping dumb villain takes out his gun….“Look at his big gun.. quick”, I said, …and shoots the poor lawyer, my son was all alert. A steady barrage of questions follow “This man is bad?” “This man who is sitting down is bad?” “Why did he shoot him?” “Look that man fell down now!” “I like this movie.” Out comes my elder son now, “Its too scary, I don’t want to watch,” he said. “But I want to…,” intercepts my younger one! We have finished about half an hour of the movie, the song ‘Dard-e-dil’ is going on now. One son is lying down and the other is sitting right next to me, reading my post as I write it, both watching the movie quietly. I have finally stretched my legs on the footstool, relaxing and unwinding after having one of the most hectic weeks of this term. Karz has been one of my most favourite Hindi movies of all times and Rishi Kapoor my favourite hero for a very very long time. (He happened to be one of the judges at the Miss India contest when I had taken part, he was the one to ask me my on-stage question and he approached me in the flight on the way back …..but anyway that’s a different story for another time!) As kids, my sister and I were big Hindi movie buffs, and thanks to my mother, had a good collection of video tapes at home. Karz was one of them and it used to get played over and over again during lunch-time breaks, weekends, late nights or just whenever we got a chance. ‘Om shanti om’ song is playing now and my elder son suddenly loses interest in my blog and starts shouting excitedly “I have heard this song, Om Shanti Om has the same song too!” He was referring to the Shahrukh Khan movie featuring the same title song, so now there is a further interest developed in watching this movie. Good! But it also means that I have to keep translating the movie for him, as I am trying to watch it myself and trying to write this blog….talk about unwinding! Oh..one of my favourite tracks is playing http://www.rameshmusic.com/song.asp?songid=old43 where ‘Ravi Verma’ (Rishi Kapoor) and ‘Tina’ Tina Munim are riding their bicycles and passing through the small town where Ravi is getting memory flashes about his earlier life as he is passing through the tea estates and other familiar places, till he gets a massive headache and falls down. ‘Shanta Prasad Verma ke ghar mein na kabhi police aayi hain, na kabhi aayegi, Charanjit’, Rani mata says this ‘seena-taanke’ with age-old pride as she bangs the phone down held by Charanjit. ‘Ravi aa gaya…..tu aa gaya beta!’ with the bells ringing in the background, the ex-Rani ma now dressed in a plain black saree utters these words, her first words in 20 years! PS: The title of this post was given by my elder son. Want more Hindi movies? Try Aashiqui2. Curious to know the answer to these questions. Please keep on reading this blog, sooner or later the mystery will be revealed. Loved the simplicity and the over-dramatisation of films in that 'zamana'…thanks for your input Reena. Himesh Reshamiya ka Karzzz to nahi dekha but a movie without Chintuji would certainly be missing on something. Thanks for your compliment Abhay and for your list of questions like you have rightly mentioned, dekhenge isi blog mein, ek naye post pe, humlog! The 60's to 90's movies are fun to watch today! I am watching B r Chopra's Mahabharata these days and my, its so funny! Thanks for visiting my blog. I guess this is your first time here? Yes old movies are a good way to re-live old memories besides it helps me share those memories with my children too.